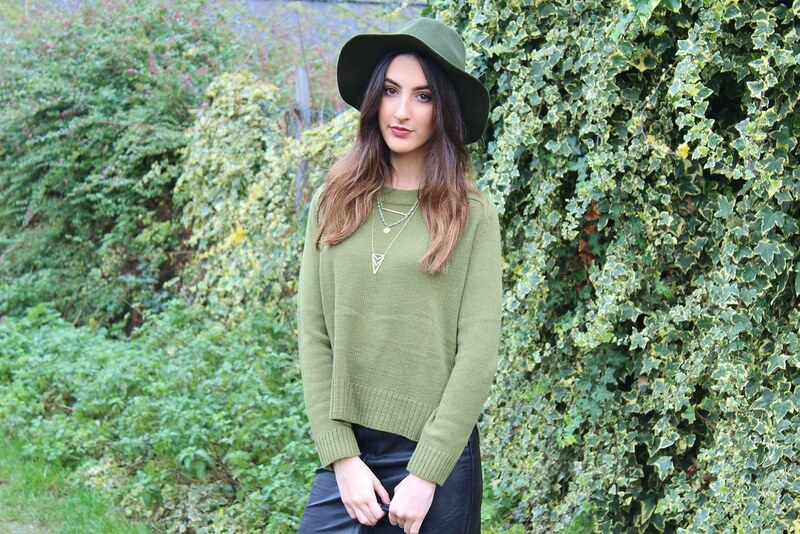 The awkward moment when you and your outfit blend into the background - what can I say I love Khaki at the moment and this jumper! I love the colour and the fact it's not overly thick as it's not too cold yet but it's also not exactly warm either. I've been searching for a perfect leather skirt for maybe a year and finally found the one on Missguided, it fits me perfectly and I think it makes even the most casual of looks look put together and classy. 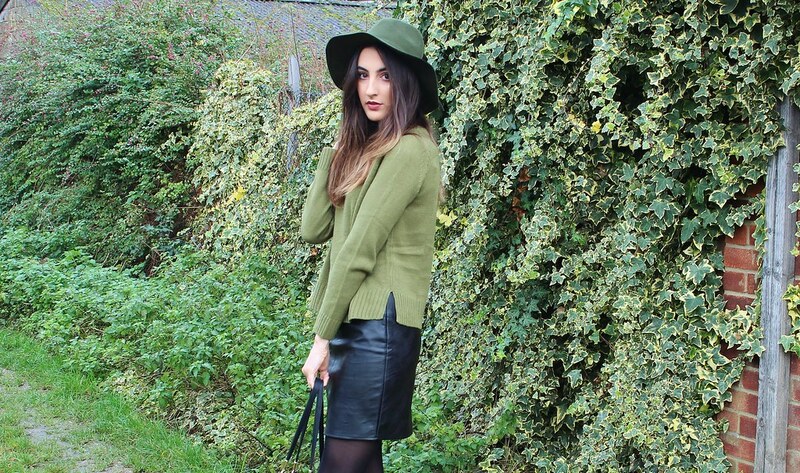 You can't really go wrong with a leather skirt! A new recent addition are these Warehouse boots. These are exactly what I wanted! A mid-heel leather pointed boot with no Silver or Gold hardware. I'm not really a fan of boots with buckles and details anymore as I like to wear these with whatever outfit I want without worrying about if the hardware clashes with my jewellery. I've practically worn these everyday as I just think they look chic and classic with all outfits. 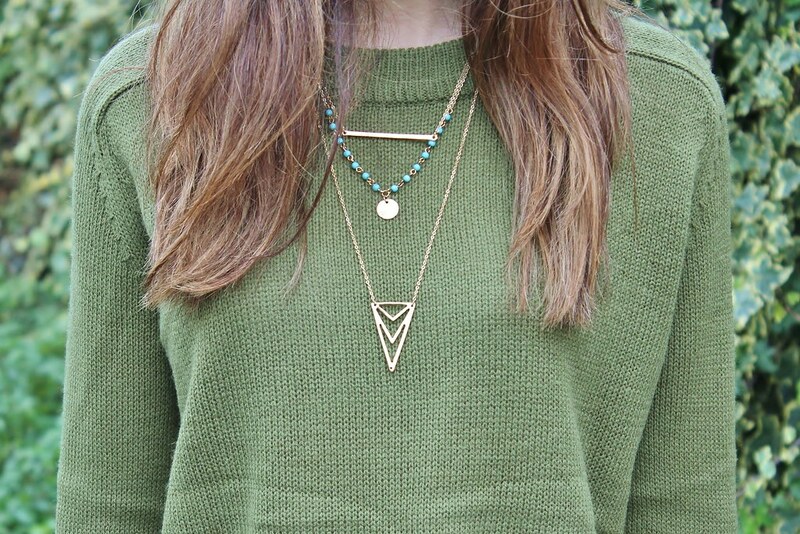 Adding a little accessories is this Happiness Boutique Geometric Drop Necklace. I love the style of dainty, layered necklaces and I don't have any in Gold so this was a lovely to pair with this Marc B 'Rita' Bag as it also has gold hardware. Everyone has complimented me on this bag. It's the perfect size, not too big or small and fits all you need. I love that this bag holds it shape and has a timeless feel about it so I know this won't ever go out of style!